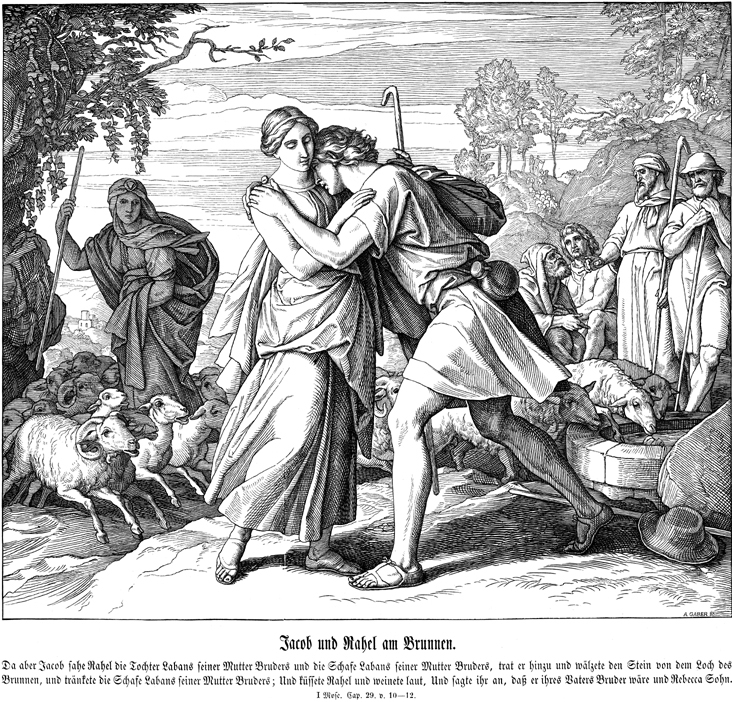 Jacob and Rachel ; Julius SCHNORR von CAROSFELD; c. 1855 woodcut from "Bibel in Bildern"
The meeting of Jacob and Rachel is a real love at first sight. 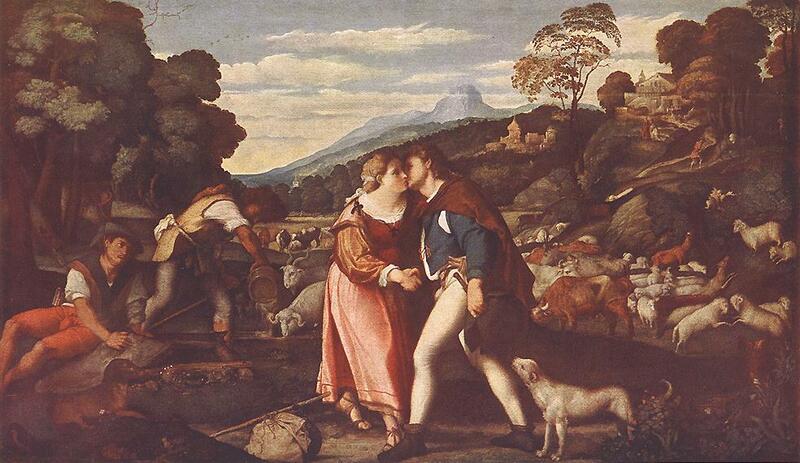 The young man arrives at his uncle’s house and sees beautiful Rachel who is a shepherdess. He gives her a kiss or he helps her by lifting the stone above the well to water her flock. But Jacob is not yet out of his pains since his uncle asks him to work for seven years to obtain his daughter and since, at the last moment, he will replace Rachel by her elder sister Lea! Without losing courage Jacob will work for another seven years to marry Rachel and will find himself married to both sisters. Isaac welcomes Rebecca who arrives on a camel. It is this oriental aspect which differentiates the two scenes. And Jacob said to them : "My brethren, Know ye Laban? Is he well? " And they said : "He is well: and, behold, Rachel his daughter comes with the sheep." … And while he yet spoke with them, Rachel came with her father's sheep: for she kept them. And it came to pass, when Jacob saw Rachel the daughter of Laban his mother's brother, and the sheep of Laban his mother's brother, that Jacob went near, and rolled the stone from the well's mouth, and watered the flock of Laban his mother's brother. And Jacob kissed Rachel, and lifted up his voice, and wept. And Jacob told Rachel that he was her father's brother, and that he was Rebekah's son: and she ran and told her father. The Meeting of Rachel and Jacob is the source of a pleasant pastoral. But Rachel’s elder sister is not far; it is she who marries Jacob without being aware of it. Jacob meets Rachel; RAPHAEL; 1518 fresco; Raphael’s loggia, Vatican Palace. Two very different visions of the meeting at the well. The Meeting of Jacob and Rachel near the well; Marc CHAGALL; 1931-34; print; Musée National Message Biblique Marc Chagall, Nice.